As far as gold bar investments go, 10 ounce bars are typically reserved for higher level investors. Before simply buying a bar of this size it is important that you learn as much about them as possible. A common misconception is that all bars of a similar size are exactly the same when really there is nothing further from the truth. The reality is that there are so many different producers of these gold bars and with different producers comes a variety of different prices. While it may seem a little obtuse to think that brand loyalty can possibly exist in the precious metals industry, it actually is abundant. In fact, most investors, in order to remain brand loyal, will spend more money on a bar produced by their favorite company than a similarly sized bar produced by a different company, even if the price is cheaper. With the variety of different producers and distributors of precious metals out there, it comes as no surprise that choosing just one brand or dealer is very difficult. 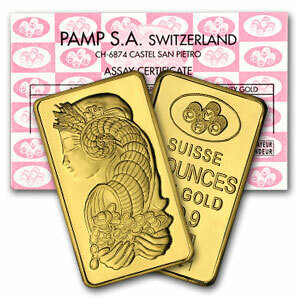 In the following few sections we will briefly describe just about everything there is to know about 10 ounce gold bars. Like we briefly discussed in the previous section, there are a number of different producers of gold bars out there for you to choose from. While you may not think that there is a difference between one 10 ounce bar from another, there really is. If you are an investor who is looking to purchase a 10 ounce gold bar, you are likely at least mid-range investor who has some experience in precious metals trading. The differences between bars of different producers are typically not huge, but they do make a difference. For example, a plain bar with nothing on it is not nearly as attractive to investors as a bar that bears the name of the company that produced it. When you are purchasing 10 ounce gold bars one of the most important things you should be aware of is how the gold bar is packaged. Since 10 ounce bars are amongst some of the larger ones out there, they are typically shipped as is and do not usually have any plastic encasement. With that being said there are some 10 ounce gold bars that come encased in plastic accompanied with assay. Assay that comes with gold bars is basically a certification that insures the owner that their gold bar is authentic and not counterfeit. The reason assay is necessary is because a bar that is encased in plastic is usually expected to stay in plastic and for this reason the owner has no real way of knowing the authenticity of the bar in question. If your gold bar is shipped without any protective casing it makes no big difference, so long as you purchase from a reputable dealer. The only thing that it means is that you should take more care of a bar with no casing because gold is very susceptible to damaging. Gold is a very soft metal and in order to preserve your investment it is important that you take extreme care of your bars. 10 ounce gold bars are not the biggest ones out there for investors to purchase, but they are big enough that storing a lot of them may become a bit of a challenge. Unlike 1 and 2.5 gram gold bars the ten ounce versions are much larger and while they are not likely to be misplaced, their size leaves them susceptible to being damaged. The dimensions of your average 10 ounce gold bars are 2 5/16”x1 5/16”x3/8”. Of course this is just an average and gold bars of the same size may have varying dimensions based on the company that produces them. Online gold and silver dealers are in business in order to make a profit and because of this they adjust the prices of their products accordingly. The value of gold is always changing and so too are the prices of products that are available online. To be a sound investor it is your job to always be aware of the current spot value of gold so that you know whether you are getting a good deal on your gold purchase or not. 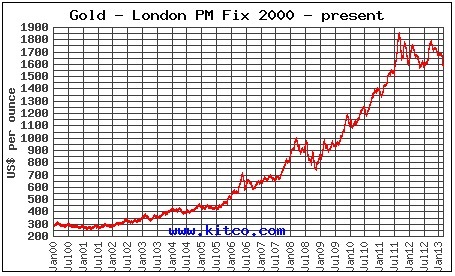 When in the market for 10 ounce gold bars you can most often expect to find a premium of anywhere from $30-$40. The exact amount of the premium is completely dependent on both the producer of the bar you are going to buy as well as the dealer who is selling it. Shopping around from site to site insures that you will be getting the best value for your money.